Can be used alone or with 7263 arched bridge. For K or M Track. 3 clips for mounting K Track and instructions for setting up bridges. Height 45 mm / 1-3/4“. Length 180 mm / 7-3/32“. 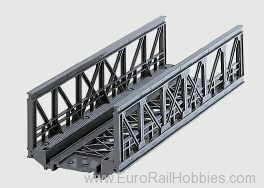 Bridges and approach ramps bring the third dimension to a model railroad layout: from flatness to a sense of height. From the simple bridging of a road or river, to crossing several tracks, to realistically linking different levels on the layout – the Märklin accessory program offers the right solution for each task.